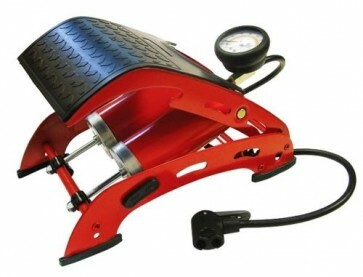 The Faithful Double Cylinder Foot Pump is a rapid action twin cylinder foot pump for quick tyre inflation with many other features that make it simple and easy to use. The tough steel frame has rubber feet and an ergonomic, rubberised treadplate to both improve the surface grip and prevent foot slippage when the pump is in use. The pump is fitted with an analogue pressure gauge with a maximum reading of 100PSI / 7Bar and a generous 60cm long rubber hose, fitted with a double head connector for use with both Schrader and Presta valves. Under side hose clips are also provided for neat and easy storage. Supplied complete with additional adaptors for use with balls, toys and other inflatable items. Hose length: 60cm. Maximum pressure reading: 100PSI / 7Bar.